Some people planning a tourist trip to Stockholm arriving on a cruise or by other means have asked me for a storage place for their luggage (or baggage) as well as lockers to store valuable things that they do not want to carry around. Many of you would also like to enjoy some sightseeing in Stockholm without baggage before heading to the cruise liner or to Arlanda airport. Let me tell you where to find a place for baggage storage and several lockers. To date there is no single place to store your luggage close to the different cruise ports in Stockholm. The information I have is that you cannot go aboard and leave your luggage on the cruise liner until boarding time has started. There are different sized lockers (called förvaringsboxar in Swedish) available for all travellers at Stockholm’s Central Station. This station is divided in two parts: 1) the part known as T-Centralen which hosts Stockholm’s three subway lines and accessible mainly through Sergels torg Square and 2) the part known nowadays as Stockholm City where commuter trains (pendeltåg) arrive and served by many bus lines too. Both parts are communicated underground. The lockers are located in the Stockholm City part. (There is a map of both parts of the Central Station available to download here although there are plenty of signs to guide you). Lockers are located on the lower floor besides SL Costumer Care Center and on the 1st floor besides Panini and Blueberry stores. There are two sizes for the lockers: small (36 cm width x 44 cm height x 60 cm depth; 14.1″ x 17.3″ x 23.6″) and large (46 cm x 60 cm x 85 cm; 18.1″ x 23.6″ x 33.4″). You can rent them for 4 hours or a day. The price is 60 SEK (~$7.65/£5.40/6€) / 4h and 70 SEK (~$8.92/£6.30/7€) / day for the small ones and 80 SEK (~$10.20/£7.20/8€) / 4h and 90 SEK (~$11.45/£8.10/9€) / day for the larger ones. Credit card or coins can be used to pay. If you have extra size baggage there is a manned storage place on the lower floor besides the SL Center. Opening times: every day 9 AM to 6:30 PM. 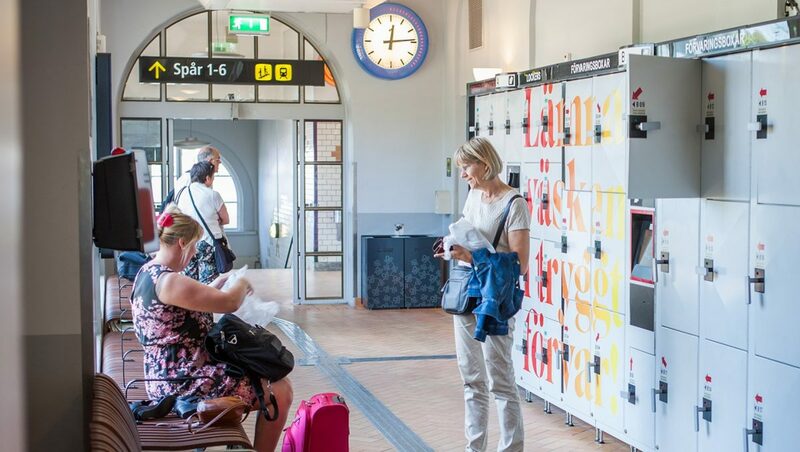 These lockers can be very useful if you are planning to travel between Arlanda airport and Stockholm City Center using the cheapest way possible because commuter trains depart from this station. Cityterminalen is the Swedish name for Stockholm’s Bus Station and it is located very close to the Central Station. You can get on buses to other destinations in Sweden as well as Flygbussarna and Flixbus buses connecting the city center and Arlanda Airport. At Cityterminalen there are lockers on both the 1st and the 2nd floor. On the first floor the lockers are located between gate 4 and gate 5 whereas on the second floor they are located between gates 15 and 18. Price and size for the lockers is similar to the ones at Central Station. On the second floor you will also find storage lockers for special baggage like golf bags or ski bags. These lockers have a special size (29 cm x 185 cm x 56 cm; 11.4″ x 72.8″ x 22″. Price: 120 SEK (~$15.31/£10.81/12 €/24h). There is a map for the bus station here where you can locate the lockers. You can also check my article on How to Travel Between Stockholm Cruise Port and The City Center or read my plans for What to See and Do in Stockholm in 3 Days. If you have any question or doubt and would like me to help you feel free to drop me a line in the comments section below.